Each chamber has two ports. Load cell sample following the recommended volume for your slide type (shown in the table) into one port. The second port allows air to escape for easy loading. The PD100 slides are standard chamber thickness, accommodating cells from 2 to 80µm in diameter. PD slides are individually QC-checked and packed in microscope slide boxes. Each slide is ready-to-use. The PD300 slides are larger slides designed for cells >80µm in diameter, such as adipocytes. The Cellometer Auto 2000, Vision, and Vision CBA instruments are compatible with the PD300 slides. SD100 slides are standard slide thickness, for cells ranging from 2 to 80µm in diameter. Each slide has a protective film on both sides that must be removed before use. 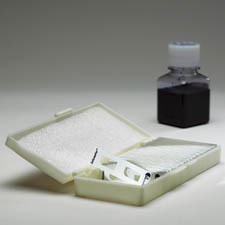 The SD100 slides are a cost-effective alternative to the ready-to-use PD100 slides. SD025 slides are for cells < 20 microns in diameter. Each slide has a protective film on both sides that must be removed before use. The SD025 slides are a cost-effective alternative to the ready-to-use PD100 slides. Disposable, all plastic counting chambers compatible with all Cellometer Cell Counters. Ready to use. Disposable, all plastic counting chambers for cells >80 microns in diameter Compatible with Cellometer Auto 2000, Vision and Vision CBA. Ready to use. Disposable, all plastic counting chambers compatible with all Cellometer Cell Counters. Remove protective film before use. If you would like to purchase our CP2 disposable counting chamber slides that contain a hemacytometer grid on the slide please visit the disposable hemacytometer page.